Although I define Seiden once in context in chapter 19 of The Shore in Twilight, the subject deserves a bit more explanation. 正殿　[せいでん]　Seiden ("true building"); the main buildings of the Imperial Palace complex, where the business of government mostly takes place. 正寝　[せいしん]　Seishin ("true sleep"); the main buildings of the Inner Palace complex. 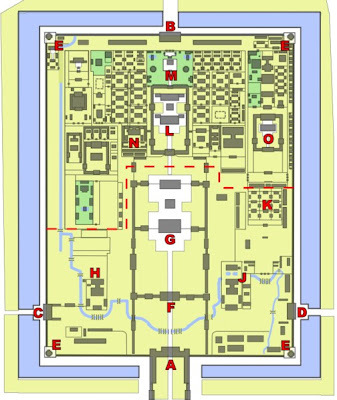 The accompanying text isn't very clear, but examining this contemporary map, the Seishin would be what's known as the Palace of Heavenly Purity (L), located in the Inner Palace (or court). The Seiden would probably map to the Hall of Supreme Harmony (G). The dashed red line marks the division between the Inner and Outer Palaces (courts). From Risai's description, we know that a wall separates the Seishin from the Ka-den (conservatory). It might help to imagine M and L reversed in the layout, with M representing the conservatory where Risai recuperated. Keep in mind that in the world of the Twelve Kingdoms, this layout is essentially vertical rather than horizontal. The Outer Palace is physically located below the Inner Palace, with the "Five Gates" (A) at the bottom, and the Seishin at the top.